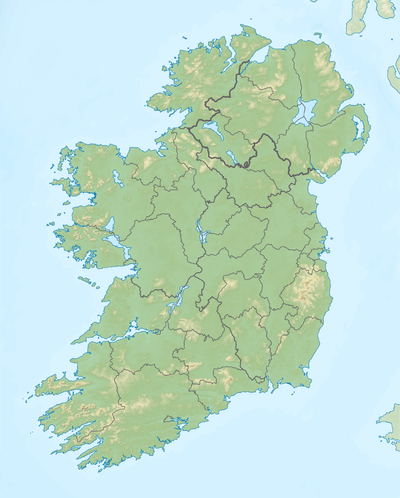 Mangerton or Mangerton Mountain (Irish: an Mhangarta) is a mountain in County Kerry, Republic of Ireland. At a height of 839 m (2,753 ft) it is the tallest of the Mangerton range and 25th tallest in Ireland. Its western slope lies within Killarney National Park. Mangerton is part of a massif that also includes the summits of Mangerton North Top (782 metres (2,566 ft)), Glencappul Top (700 metres (2,300 ft)) and Stoompa (705 metres (2,313 ft)). Each of these summits are flat or slightly rounded. 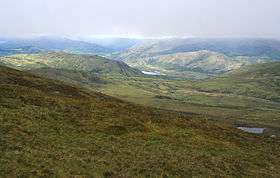 Enclosed within the massif is a deep U-shaped valley called Glencappul or Horse's Glen. There are three lochs within Glencappul—Lough Garagarry (Loch Garaigre), Lough Mannagh (Loch Meáin) and Lough Erhogh. A short walk north of Mangerton's summit is The Devil's Punchbowl (Poll Ifrinn), an oval-shaped hollow with a loch in the middle. The far northern slope of Mangerton was the site of a battle in 1262 between the Mac Cárthaigh (Gaelic forces) and FitzGeralds (Anglo-Norman forces). The battle-site is known as Tooreencormick (from Tuairín Cormaic meaning "little field of Cormac") after Cormac MacCárthaigh, who was killed during the clash. The battle is considered a MacCarthy success however because the Normans were kept out of the region.